SECCA, the Southeastern Center for Contemporary Art, reopened this summer following an extensive renovation. Not only the building was refreshed and improved; the institution’s identity was completely redesigned by Luke Hayman and his team Pentagram). Located in Winston-Salem, North Carolina, SECCA is committed to presenting contemporary art to a local, national and international audience. As a non-collecting institution, SECCA places particular value on its space, one always evolving and changing with each visiting exhibition or production. “Flux” became an important key word during design explorations and the final identity conveys a continuing flow; the logo literally moves and fluctuates, echoing the constant change of SECCA’s galleries and community programs. A visit to the organization’s homepage, www.secca.org, will illustrate the fluidity of the new logo, yet print materials also capture its motion. Though the presentation is static, the logo imparts the constant movement of the animated mark by appearing in different configurations in each application. These varied stills imbue movement across stationery, collateral materials, banners and signage. The fonts used for the identity are from the Monotype Grotesque family. The color palette, employing a rich spectrum of greens, reflects the wooded property and lush foliage surrounding the center. In an exciting and unusual twist, the architect used the identity’s palette to apply color to the building, an uncommon and welcome departure from the usual process where graphic design takes inspiration from architecture. The bold new colors are featured in fins of green across the building’s façade. Throughout the project the design team worked closely with SECCA director Mark Leach and curator Steven Matijcio. The center’s website and signage was designed by Elliot Strunk of Fifth Letter from Pentagram’s core guidelines. 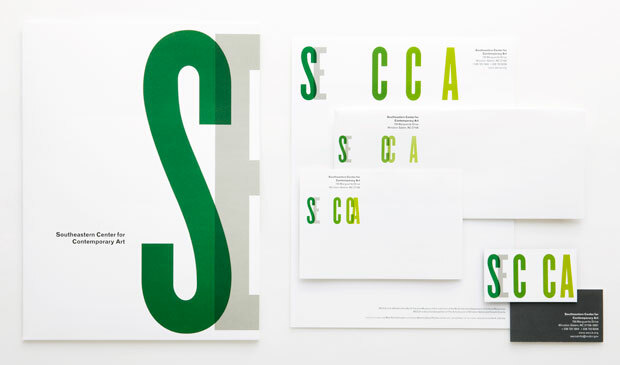 SECCA is affiliated with the North Carolina Museum of Art whose new identity Pentagram designed last year.